BUENOS AIRES, Argentina — As leaders of the world’s top economies met for the G20 in Buenos Aires Friday, thousands protesting their presence and policies were kept miles away by police. Members of 70 different groups joined forces to call attention to a range of concerns, from workers’ rights to climate change. The protesters marched down the 9 de Julio Avenue, one of the capital’s main thoroughfares while five miles away presidents, ministers and their delegations held talks. Among the leaders attending, President Donald Trump, Russian President Vladimir Putin, Chinese Premier XiJinping and British Prime Minister Theresa May. Pres. Trump, Mexican President Enrique Peña Nieto and Canadian Prime Minister Justin Trudeau Canada and Mexico signed a new trade agreement, the USMCA pact, a modernization of the North America Free Trade Agreement (NAFTA). Demonstrators expressed concern about the lack of access to the leaders. 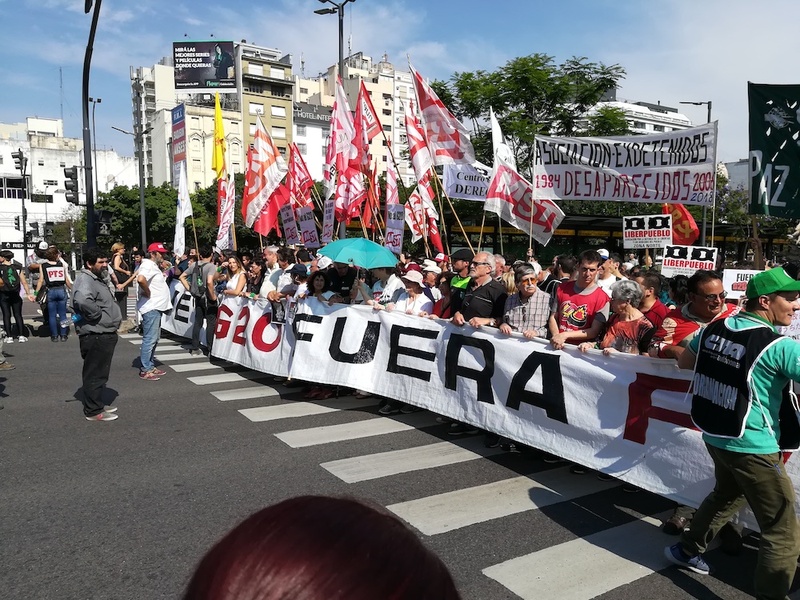 “There is no opportunity to chat with them,” said Pablo Micheli, Secretary of the Argentine Workers’ Central Union (Central de Trabajadores de la Argentina). He said dialogue with representatives from the protesting organizations would strengthen democracies and that is why workers should get a seat at the table. “Workers are the ones who produce the wealth of those nations,” said Dr. Eduardo Barragan, 72. Barragan, a Colombian physician who has been living in Buenos Aires for 38 years, does not believe capitalism and workers’ rights can co-exist. “Capitalism encourages the exploitation of workers,” he said.